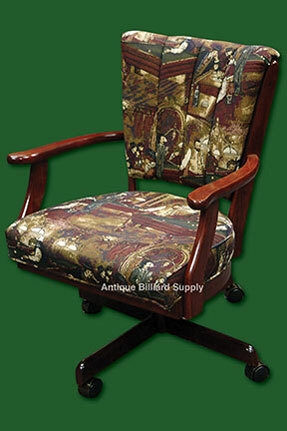 #7-18 Game table chair with billiard-themed fabric. Solid oak construction, made in U.S.A. at a factory that closed years ago. Dark cherry finish on exposed wood components. Stain resistant upholstery featuring snooker and billiard items on wine-colored background. Includes rollers on legs for maximum versatility. Four available. Excellent condition.